One of Russia’s central television channels, RTR, has recently aired a documentary about US astronauts who allegedly came across extraterrestrial civilizations. 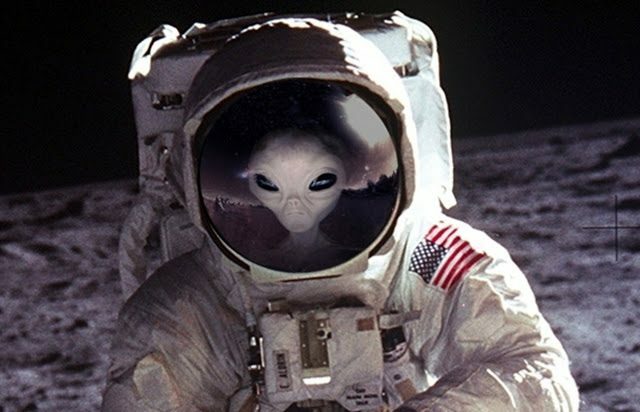 The film showed Russian ufologist Vladimir Azhazha and astronomer Yevgeny Arsyukhin telling that expeditions to the Moon launched within 1969-1972 allegedly came across UFOs. The researchers state that flying objects of extraterrestrial origin were persistently spying on American Apollos. They said the expeditions to the Moon looked very much like a race and presented a film demonstrating a luminous object closely following an American spaceship. Records of communication between astronauts and the Mission Control Center were also included into the film but they were absolutely inaudible as they had been purposefully jammed by Americans. They expected that the expeditions would find something astonishing on the Moon and with the view of keeping their communication with the surface secret they encoded their messages to the MCC. When the records of communication were later deciphered it turned out that the US missions came across lunar bases, remains of space vehicles and deserted towns on the Moon. The film stated that lunar creatures would not tolerate the presence of Earth dwellers for long. When Americans brought a dummy car to furrow Moon craters, the creatures living on the satellite began to demonstrate their furious protest against the US presence on the Moon. Filmmakers said that green dwellers of the Moon told Americans to go home as they wanted to keep secret the sublunar bases that they used to observe the life on the Earth. It was alleged that NASA was afraid of conflicting with a highly developed civilization and immediately stopped the program. Does the film sound believable? In a couple of days, Americans demonstrated their documentary about the Apollo expeditions, In the Shadow of the Moon, with records of the flights to the Moon that were specially processed after the video archives of the Moon program had disappeared. Is it true that the archives were lost? It seems that the CIA wanted to wipe out tracks of a contact between US astronauts and extraterrestrials. It is an open secret by the way that films demonstrating the landing of American astronauts on the Moon and Neil Armstrong’s walk about the lunar surface were lost. What is more, records telling about astronauts’ health during the flights to the Moon, information about spaceships and other 700 messages sent from the board of spaceships launched in the framework of the Apollo program are also missing. Before the late 1970s the films had been kept at the US National Archives then were moved to NASA and later disappeared at all. It took NASA officials a year to conduct searches of the films but they managed to find just not more than ten films. Will anyone believe that evidence of US’s biggest triumph may so easily disappear from the NASA archives? An expertise of the Moon pictures demonstrated in the Russian documentary revealed that they were no ordinary photos but simply some daub. Deputy director of the Comparative Planetology Laboratory Doctor of geological sciences Alexander Bazilevsky says that experts are from time to time requested to conduct an expertise of this type of photos. The Lunar Orbiter stations shot the Moon surface, then developed films right on board the spaceships and telecast them to the surface. As a result of this film development any unexpected things or elements could appear on pictures, and it explains why one of the pictures showed in the documentary had the word ‘spire’. In a word, none of the pictures demonstrated in the documentary can be the evidence of aliens’ existence on the Moon. This is strange that films with really important evidence can disappear from NASA. Several years ago, over 100 g of lunar soil and meteorites were stolen from the collection of the Johnson Space Center. And that was not the only incident of the kind there. A former NASA official explained that the unique films had been probably lost after they were several times moved from one place to another within the past forty years. The NASA official who requested anonymity also told a really interesting story. When President Bush announced recommencement of the lunar program the National Aeronautics and Space Administration asked aged researchers who had taken part in the Apollo expeditions earlier to meet experts who were going to start a new mission. One of the aged researchers who came to the meeting had designed a device to measure lunar radiation. The device could measure radiation before humans landed the planet and could transmit information even when the Apollos were back to the surface. In the framework of the program heaps of records were collected. But when the program was no longer financed and stopped the bobbins with ciphered films were discarded. But the old engineer took the films and placed them to his basement where they are still being kept. Unfortunately there is no opportunity to decipher the films as a special device able to decode such records was also utilized when the program ended. The NASA official admits that the flights to the Moon were rather a political mission as the USA wanted to gain revenge after the Soviet spaceman Gagarin was the first to enter the space. And the USA spent $150 billion to start the lunar program to demonstrate the power of the American science and engineering. It was a very expensive project that was easily abandoned as soon as financing was stopped. The American Internet service Google is ready to pay $20 million to a private company that succeeds in landing a buggy on the Moon for transmitting photo and video information of one gigabyte in size right to the Earth surface. The sum is to be paid in case a buggy lands the Moon before 2012, and a company may get just $15 million if it launches such a buggy within the two next years after 2012. At that, Google conditions that such a buggy must walk at least 40 centimeters along the Moon surface, transmit a series of pictures from the Moon including ‘a self-portrait’ against the lunar background, a panoramic picture of the planet and on-line video. As it turned out, meteorites hit the lunar surface oftener than is usually believed which is really dangerous for automatic stations and manned spaceships. The Moon has no atmospheric protection, and even a small meteor can cause a tragedy if it hits a spaceship or a manned space station. Today, the Russian project of the Moon expedition is even less developed than it was under the direction of Korolev. The documentary In the Shadow of the Moon includes an interview given by five of the eight extant men who had ever entered space. They are now aged over seventy. None of them has ever officially stated that he saw something supernatural in space. At that, they are unanimous that the lunar race was part of the cold war when pure science was of second importance. Neil Armstrong, the first man to land the Moon, is now living an anchorite life in Ohio where he teaches astronautics at the university. NASA is going to conduct another mission to the Moon with a spaceship Orion resembling Apollo and stuffed with steroids. It is planned that four astronauts will fly round the Moon in 2018. If the project goes OK a landing module is to land the lunar surface in 2020. Russia’s ambitions as concerning Moon exploration are rather modest. A Russian astronaut may land the planet only as a member of a Chinese-Russian expedition. Chinese researchers are working on this project and invite Russia to participate in it as well. 2016: The Dubious Mystery of Mystery Hill and America’s Stonehenge.